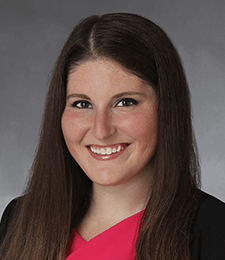 Jillian Vukson is a senior litigation associate with Goldberg, Miller & Rubin. Jillian’s practice concentrates on automotive and premises liability defense. She focuses on third party actions, as well as UIM and UM matters both at the state and federal levels. With over nine years of experience, she has accumulated an extraordinary amount of litigation experience resulting in numerous trials and over 100 arbitrations to verdict, to date. Jillian’s practice spans from Philadelphia to all of the areas in surrounding counties, including Chester, Montgomery, Bucks, Delaware, Berks, and Northampton. Her vast litigation experience has enabled her to provide distinctive insight into trial procedure in the various counties that has allowed her to effectively counsel her clients and evaluate claims both at the initiation of the lawsuit and during the litigation process through trial. In addition to her legal practice, Jillian has also served as an arbitrator for the Philadelphia County Court of Common Pleas Compulsory Arbitration Program, both as a panel member and chairperson. Her service as an arbitrator required evidentiary rulings and legal determinations regarding liability and damages, which resulted in the resolution of numerous matters before the Philadelphia Court of Common Pleas. Before entering private practice, Jillian, served as a law clerk on the Pennsylvania Superior Court, as well as the senior judicial law clerk for the President Judge of the Pike County Court of Common Pleas. Her work with the Pennsylvania Superior Court and Court of Common Pleas at both the trial and appellate levels afforded her the opportunity to consult with judges, attorneys, court staff, and juries, providing invaluable insight into jury dynamics, which she has used to her client’s advantage in developing the most effective trial strategy for each individual case. Her experience in the judiciary branch has afforded Jillian a unique perspective that is unparalleled among her peers. When she is not practicing law, she enjoys spending time with her friends and her dog. She is an avid animal lover and self-proclaimed movie buff. Jillian loves all outdoor sports, including horseback riding and hiking. She is passionate about giving back to organizations, especially those that involve cancer research for children and animal protection.